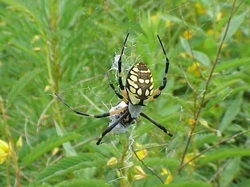 Black and Yellow Garden Spiders have bright yellow and black markings on the larger part of its body, with white around their eyes. They build large circular webs in concealed outdoor spaces, up to two feet in diameter, with a zigzag in the middle of the web to stabilize it. These spiders bite if they feel threatened, but the venom rarely effects humans. Click here to learn about the Bowl and Doily Weaver Spider!